When it comes to perfecting your eye makeup, a quality blending brush is an essential component in doing so. Luckily, Sigma has a wide selection to choose from so no matter what look it is you’re trying to create, we've got you covered! 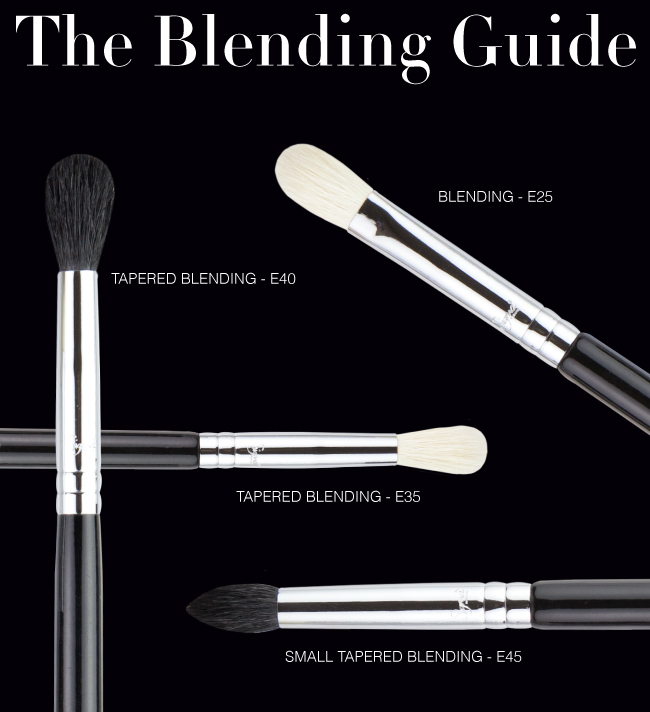 Read on to learn about each of our blending brushes and how to best use them! E25 – Our best selling blending brush! The firm bristles on this brush allow for controlled blending. Use it to create the perfect smokey eye or simply buff out harsh lines for a well-blended effect. E35 – Slightly longer than the E25, this brush is great for applying shadow directly into the crease to give eyes more depth. E40 – Features a fluffy, rounded tip for softly blending shadows into the crease to create a seamless, diffused finish. E45 – With its very tapered and precise pointed tip, the E45 is a great tool for applying intense colors into the crease, adding depth and dimension to the eye. We also have one more blending brush from our Performance Eyes Kit: the E36! This is your go-to brush for precise blending of powder products onto small areas such as the inner corner of the eyes and into the crease. Because the E36 has small and slender bristles, it's best for elaborate and detailed eye makeup. Which blending brush is your favorite? Need the tapered blending brush in my life!!!! Have them all too, and 5 pcs travel size E25 brushes that sigmabeauty.com sent as gifts for my orders. I use and love them all! I just bought the E 40...I love it! J'aime beaucoup le E25 (mais je pense que celui avec la manche grise est plus doux que l'autre de manche noir) e le E35. Soo in need of a new E45! :) Great brushes! Oh I really need to buy ASAP. For those who have all the sigma brushes.. which is your favorite blending brush for a dark smoky eye?